Introduction: In this example you will model a system of pipes filled with water. Physical Problem: Compute and plot the velocity distribution in the pipe system shown in the figure. To plot the velocity profile within the pipe. To graph the variation of velocity out the bottom pipe. You are required to hand in print outs for the above. 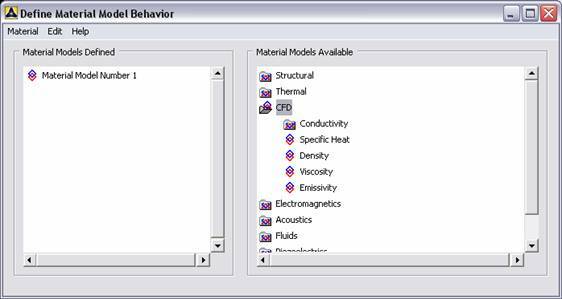 · Click on ANSYS in the programs menu. · The following menu that comes up. Enter the working directory. All your files will be stored in this directory. Also enter 64 for Total Workspace and 32 for Database. · Enter the values shown in the figure above. 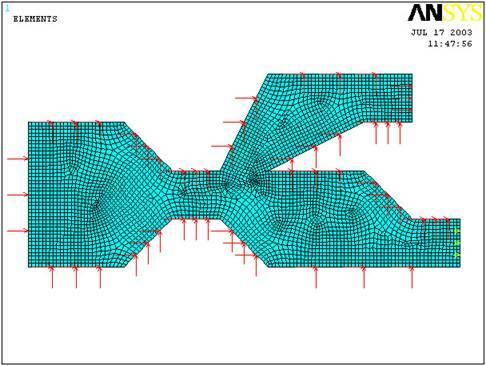 · In this problem we will model the pipe grid and then apply fluid flow to it. 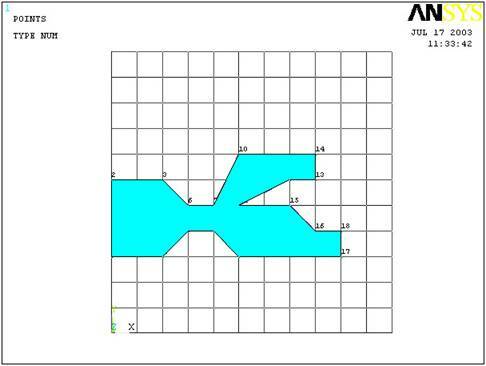 · Click Preprocessor>-Modeling-> and create the pipe grid as shown below. The modeling of the problem is done. · Type 1 in the Element type reference number. · Click on Flotran CFD and select 2D Flotran 141. Click OK. Close the 'Element types' window. · So now we have selected Element type 1 to be a Flotran element. The component will now be modeled using the principles of fluid dynamics. This finishes the selection of element type. · Go to Preprocessor>Flotran Set Up>Fluid Properties. 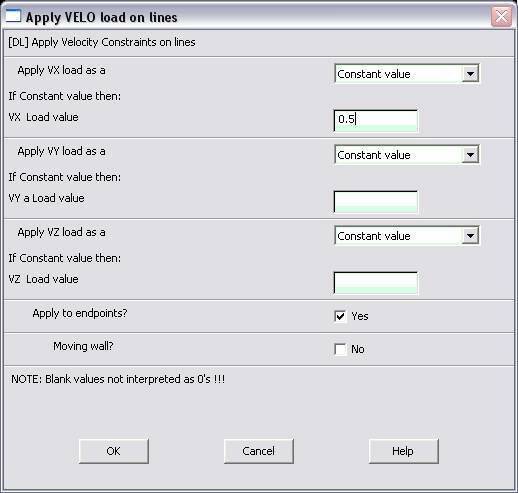 · On the box, shown below, make sure the first two input fields read Constant, and then click on OK. Another box will appear. 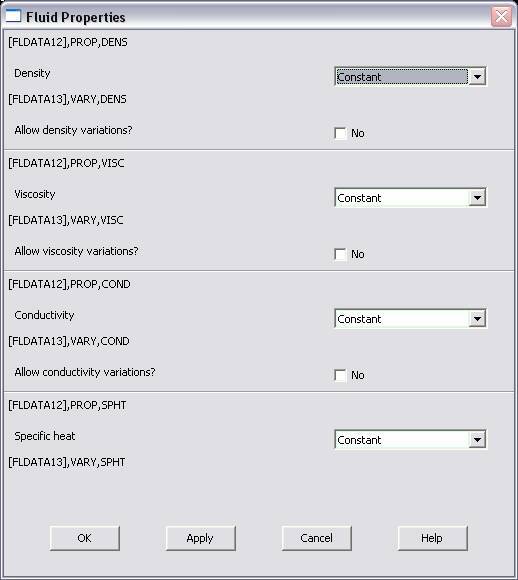 Fill in the values as shown below, then click OK.
· As displayed, choose CFD>Density. The following window appears. 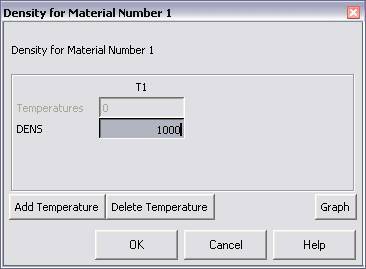 · Fill in 1000 to set the density of Water. 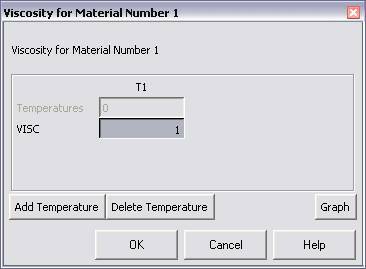 Click OK.
· Now the Material 1 has the properties defined in the above table so the Material Models window may be closed. · Go to Preprocessor>Meshing>Size Cntrls>ManualSize>Global>Size. 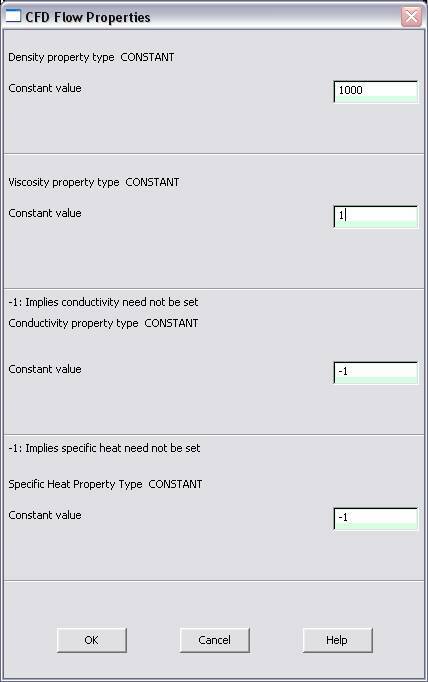 In the window that comes up type 0.025 in the field for 'Element edge length'. · Click on OK. Now when you mesh the figure ANSYS will automatically create a mesh, whose elements have a edge length of 0.025 m.
· Now go to Preprocessor>Meshing>Mesh>Areas>Free. Click Pick All. The mesh will look like the following. · Go to Preprocessor>Loads>Define Loads>Apply>Fluid CFD>Velocity>On lines. Pick the left edge of the block and Click OK. The following window comes up. · Enter 0.5 in the VX value field and click OK. The 0.5 corresponds to the velocity of 0.5 meters per second of air flowing into the pipe grid. · Repeat the above and set the velocity into the upper pipe as -1 meter/second. This is because the flow is traveling to the left, or the negative direction. · Go to Main Menu>Preprocessor>Loads>Define Loads>Apply>Fluid CFD>Pressure DOF>On Lines. Pick the bottom pipe outlet and click OK.
· Now the Modeling of the problem is done. 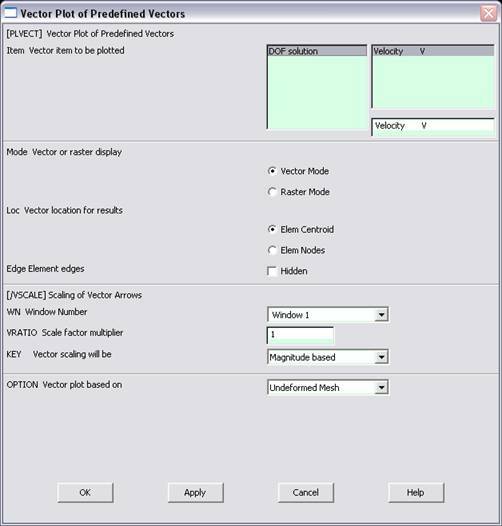 · Go to ANSYS Main Menu>Solution>Flotran Set Up>Execution Ctrl. · The following window appears. 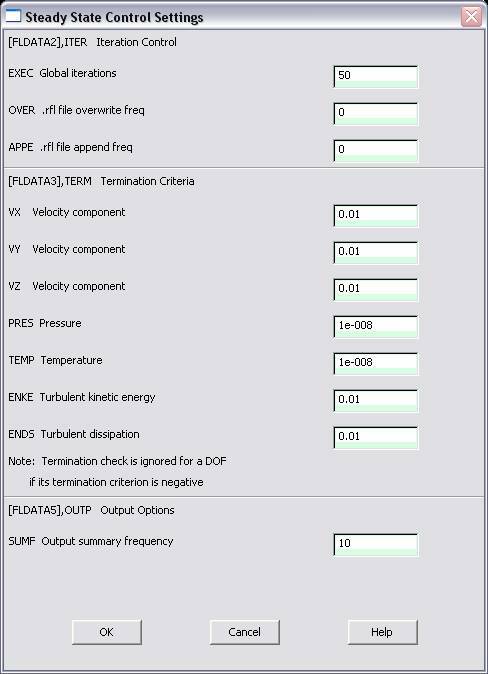 Change the first input field value to 50, as shown. No other changes are needed. Click OK.
· Go to Solution>Run FLOTRAN. 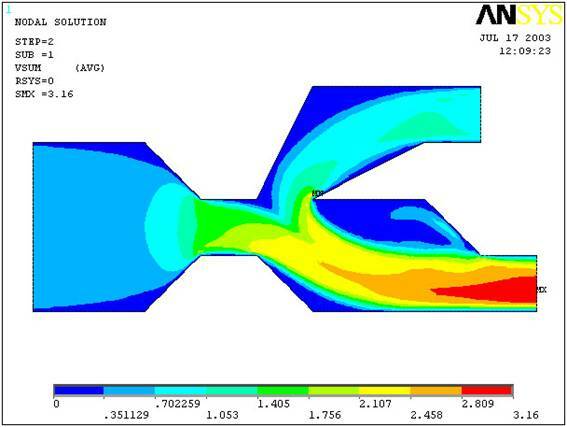 · Wait for ANSYS to solve the problem. · Click on OK and close the 'Information' window. · Go to General Postproc>Read Results>Last Set. 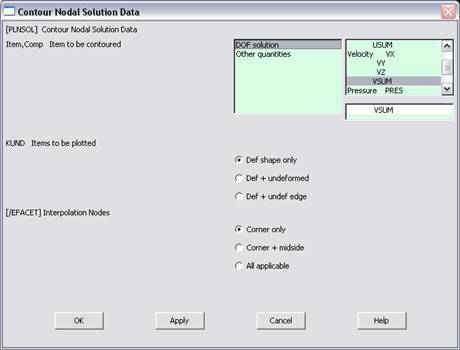 · Select DOF Solution and Velocity VSUM and Click OK.
· Select OK to accept the defaults. This will display the vector plot of the velocity gradient.